Japanese Black Trifele – Tomato Town organically grows heirloom tomatoes in the greater Kansas City area as well as Johnson County, Leawood, Lenexa, Olathe, Shawnee, Merriam KS, Independence MO and Kansas City Missouri, KCMO. Varieties include: Cherokee Purple, Brandywine, Stupice, Carbon, Black Krim, Black Cherry, Yellow Pear, Absinthe and Aunt Ruby’s German Green. 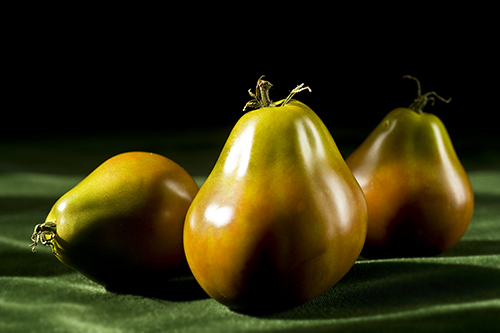 Also known as a Black Russian Truffel Tomato, the Japanese Black Trifele is a welcome addition to TomatoTown. Luscious green-shouldered specimens that have a rich smoky flavor bring a special intensity to fresh tomato salads or a tomato-basil bruschetta. Much like the Paul Robeson, they are highly-prized for their flavor, color and shape. This entry was posted on Tuesday, August 3rd, 2010 at 7:58 am. It is filed under TomatoTown Favorites, Varieties. You can follow any responses to this entry through the RSS 2.0 feed.